These Lace closures are made from temple hair which has been bleached and coloured to attain the desired colour. 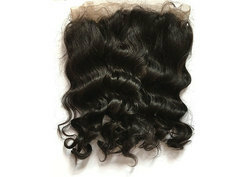 These come in lengths from 14"-20", in a variety of textures like Straight, wavy and curly. We are manufacturer, delaer, supllier of full lace wigs, front lace wigs, frontal, closure for african market.We export to USA, EUROPE, ANGOLA, SENEGAL, MOZAMBIQUE, SOUTH AFRICA, KENYA, TANZANIA.. Durable Time: 1 YEAR MIN. We offer Lace Front Wigs to our clients. Color: As per Customer need. With our massive understanding and proficiency in business sector, we have come up with a world-class collection of Lace Front Wigs. Highly acclaimed in the market, these products are accessible with us in several provisions to choice from. Also, their fine finish and accurate dimension make these products highly recommended. Mario Hairpieces & Extensions Pvt. Ltd.
We are a prestigious company engaged in offering a wide range of Lace Front Wigs. These are highly reckoned among our clients due to their superior quality and stylish nature. Offered wigs are made using best quality hairs which we sourced from the trusted vendors of the market to meet the variegated preferences of our clients. Silky straight Front lace wigs. Our lace wigs are made with silky straight hairs without tangling and baby hair in the front perimeter to have a natural look. It will have extra lace in the front for glue application and clips at the bottom. Easily manageable and washable. durable and full density.